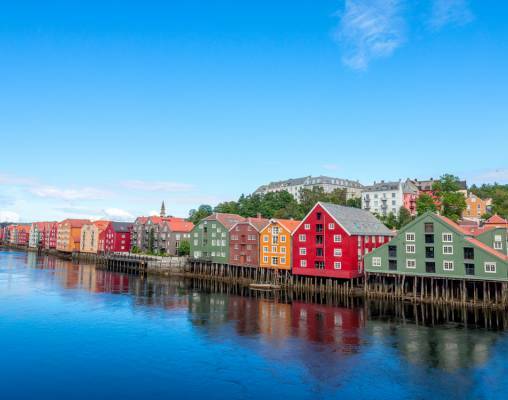 Travel the length of Norway aboard some of the world's most impressive railroad lines, discovering its delightful cities and island communities along the way. Experience life in the Arctic Circle and feast like a Viking on our fourteen day tour. 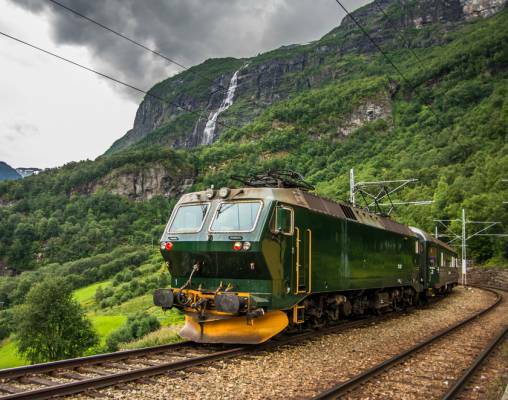 Today we enjoy two scenic journeys by rail, beginning with the Bergen Railroad. The train makes its ascent into the rugged mountains, traveling alongside deep fjords and passing through numerous tunnels hewn out of the solid rock before arriving at Myrdal, where we board the famous Flåm Railroad for an unforgettable ride along one of the steepest lines in the world. A branch line of the Bergen Railroad, the scenic Flåm Railroad takes passengers on a wonderful 12.5 mile (20km) journey up one of the steepest railroad lines in the world. On its journey from Flåm, located at the innermost corner of the Aurlandsfjord, the train negotiates horseshoe curves, twists, turns and 20 tunnels - 18 of which were drilled by hand. The scenery is truly spectacular, with rivers and waterfalls, snow-capped mountains and remote farms passing by the window as you travel towards Myrdal at 2,838 feet (865m). This evening we enjoy a Viking plank feast, with a selection of local beers, in the atmospheric Ægir Brewery, a traditional Norse-style building set beside Aurlandsfjord, its focal point an imposing central fireplace. We set out by coach into the rugged landscapes of southern Norway on Day 6, making our way to Geiranger. 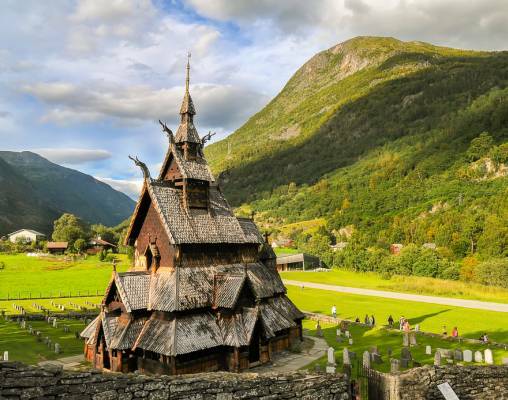 En-route we visit the rare Borgund Stave Church and the Dalsnibba viewpoint, Europe's highest fjord view at a staggering 4,500ft elevation. We make the journey to Åndalsnes today along the serpentine Trollstigen mountain road*, which offers cinematic views over the mountainous valleys and their crystalline waterfalls. From here we travel on the famous Rauma Railroad to Trondheim, our base for the next two nights. The 71 mile long railroad line delivers a spectacular journey through magnificent, contrasting landscapes. We navigate the same course as the emerald waters of the River Rauma for much of the trip, the tracks following the river as it winds around the hillsides below jagged mountain peaks. Departing Trondheim, we catch the train to Bodø. We travel north on the Nordland Railroad for a 452-mile journey to Bodø. 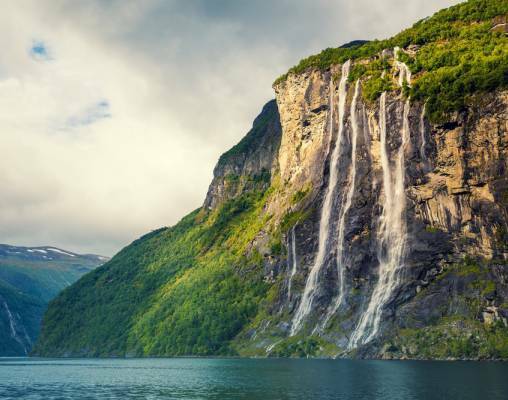 The route takes us through the beautiful and varied landscape of northern Norway, past gently sloping hills and distant mountains, majestic lakes and deep forests, rocky coastline and views across small islands and out over the open sea. We cross the Arctic Circle - 66 degrees north - shortly before reaching the town of Lonsdal, the highest point of the railroad. The train reaches Fauske before turning due west for the final short section of the journey to Bodø. Also known as the 'Polar Express', the Nordland Railroad is rightly one of the world's most famous, passing unconquerable landscapes that are a delight to experience. Vast, ever-changing environments as far as the eye can see stretch out from our comfortable carriages as we strike out across Norway's dramatic landscape, watching as clear blue lakes, sparkling fjords and the spectacular Svartisen Glacier roll by our windows. The Thon Hotel Rosenkrantz is situated on Bryggen, Bergen's historic waterfront, close to the famous fish market and the Fløibanen Funicular Railroad. The hotel has a restaurant and a lobby bar. All rooms feature light, modern décor and are well equipped with a minibar, tea and coffee making facilities, telephone, television and a hairdryer. The centrally located, 4-Star Scandic Havet Hotel in Bodø sits scenically between the Norwegian sea and the town. Located north of the Arctic Circle, this is an area known for its nature - a place where you can experience the magic of the midnight sun. The restaurant and the bar is set high in the hotel, so you can enjoy spectacular views as you dine or relax with a drink. There is also a gym and a laundry service (payable locally). The rooms also offer stunning scenery, and come with complimentary Wi-Fi, a hairdryer, an in-room safe, and complimentary Wi-Fi. 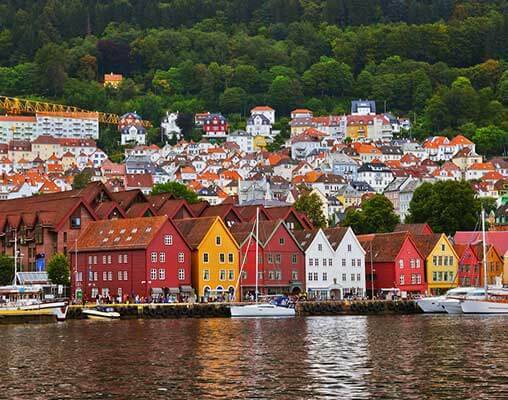 Widely regarded as one of the greatest railroad journeys in the world, this high-altitude trip through southern Norway links the old Hanseatic city of Bergen and the Norwegian capital, Oslo. The harsh climate experienced in this part of the world has produced a landscape that is breathtaking and wild, and the Bergen Railroad enables us to soak up the spectacular views whilst relaxing in warm, comfortable carriages. A branch line of the Bergen Railroad, the scenic Flåm Railroad takes passengers on a wonderful 12.5 mile (20km) journey up one of the steepest railroad lines in the world. On its journey from Flåm, located at the innermost corner of the Aurlandsfjord, the train negotiates horseshoe curves, twists, turns and 20 tunnels - 18 of which were drilled by hand. The scenery is truly spectacular, with rivers and waterfalls, snow-capped mountains and remote farms passing by the window as you travel towards Myrdal at 2,838 feet (865m). 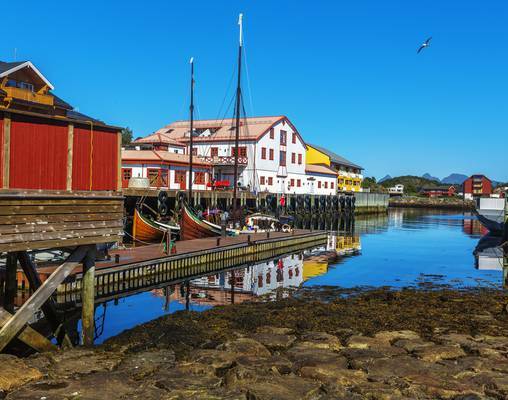 The Nordland Railroad runs from the historic Viking capital of Norway, Trondheim, to the beautiful city of Bodø in northern Norway. The railroad is 729km in length, making it Norway's largest mainline railroad. It is also one of only a few railroad lines in the world which cross the Arctic Circle. The railroad, which is also called 'the train of the midnight sun', takes passengers through the beautifully varied scenery of northern Norway and includes views of lakes, rivers and fjords, as well as the spectacular Svartisen Glacier. The Nordland Railroad crosses the Arctic Circle (66 degrees north) just before reaching Lonsdal, the highest station on the line at 512km above sea level. This part of Norway is famous as an ideal place to view the Northern Lights. During the summer, in fine weather, the sun remains visible 24 hours a day. After reaching Fauske, the most northerly point on the line, the railroad turns due west to Bodø, regarded by many as the city with the world's most beautiful coastline. Our spectacular journey on the 71 mile (114 km) Raumabanen Railroad begins in the village of Dombås. The train takes us along the valley carved by the River Rauma, offering magnificent views of the awe-inspiring crags, peaks and plateaus of the Alpine massif along the way. Further along the line we pass Trollveggen (Troll Wall), the tallest vertical rock face in Europe and then continue through the wild, awe-inspiring landscape towards the town of Åndalsnes on the shores of the beautiful Romsdal Fjord. Åndalsnes is the terminus of the Raumabanen Railroad, and from here we continue our journey by coach. 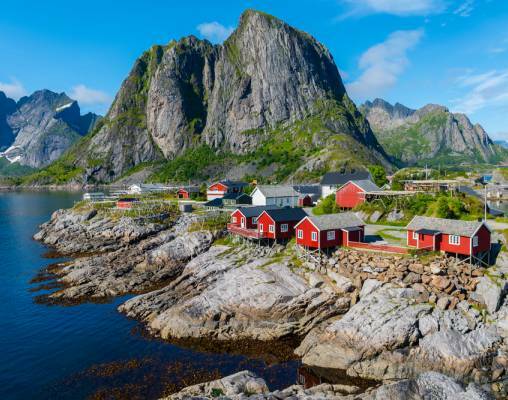 Enter your details below if you would like to be notified when 2020 dates and prices are available for Arctic Norway & Midnight Sun on the Lofoten Isles.